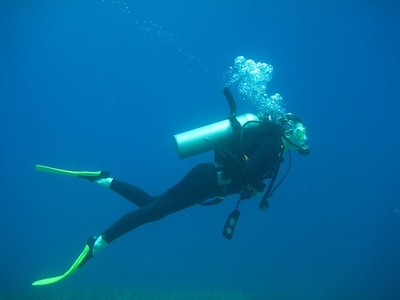 England, Britain & The U.K.
Scuba diving is employed for commercial and recreational purposes. The primary limitation on underwater diving for long periods of time is the need for a constant air supply. Historically 'scuba diving' referred to the equipment which allowed divers to breath underwater. However, 'scuba diving' now refers to the practice of diving underwater. A number of techniques are employed to allow people to dive and breath under water. Either air is pumped to the diver from the water surface or air is carried with the diver, as compressed air tanks. Recreational scuba diving dates back to the 1920's. Since this time the availability and enjoyment of scuba diving has greatly improved, with the introduction of modern equipment and diving resources. The focus of all diving, especially recreational scuba diving, is safety. Divers are certified to ensure they have the appropriate training and appreciation of the potential dangers of diving. Equipment is checked to ensure it is maintained and working correctly. 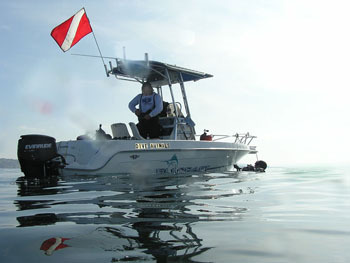 Most diving organizations also require redundancy with equipment, to further safeguard the diver. The scuba diver flag is used as an additional safety measure when diving and was introduced in 1956. 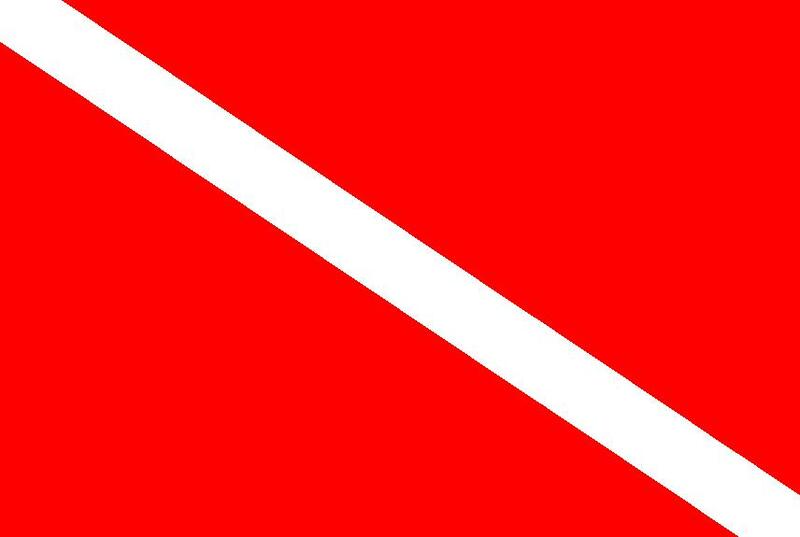 Divers are legally required (U.S.A. and Canada) to present the diver flag, on the water surface, at the descent point of all dives. The flag signals, to boats and other divers, that divers are diving at that site. The diver flag is associated solely with scuba diving and thus is commonly used on patches and decals to identify divers to one another, in social settings. The Professional Association of Diving Instructors (PADI) is one of the largest organizations which trains and supports recreational scuba divers. PADI was formed in 1966, with the mission to bring safe scuba diving practices and resources to the general public, for recreational diving purposes. PADI now oversees over 5000 dive shops and resorts, world wide. PADI certifies more than 950,000 divers per year - with approximately 60% of these being new divers at the introductory, 'Open Water', level. PADI's instructional methods involve standardized modules which are based upon skill level and achievement of specific techniques. PADI almost exclusively focuses on 'open water' diving, in which the diver always has an unobstructed view of the water surface, for safety. 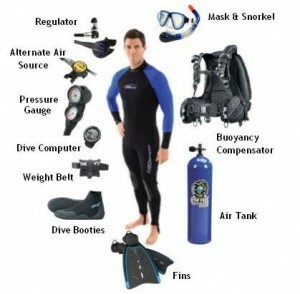 Scuba equipment allows the diver to safely and comfortably dive underwater, for long periods of time. 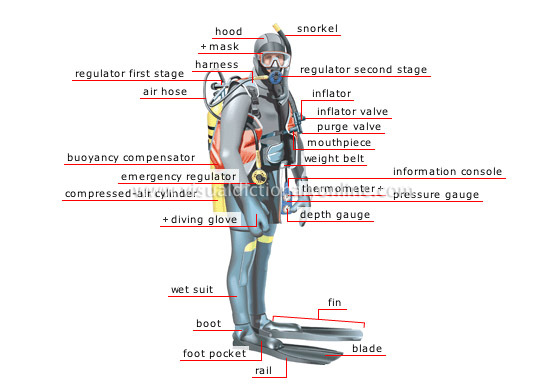 In order to dive underwater several pieces of equipment are required; an air supply (primary requirement) with a regulator, a buoyancy control device and some form of thermal or physical protection. Most recreational divers use compressed bottled air which is delivered to the diver on demand, by regular breathing, using a double regulatory system. As the diver changes depth under water, the diver's buoyancy varies; as the air in their lungs expands or contract. To help maintain an appropriate swimming depth the diver wears a jacket called a BCD or buoyancy control device. The BCD acts much like a fish's swim bladder and allows divers' to change their buoyancy and hover effortlessly at any chosen depth. Depending upon the location of the dive, ambient temperature and depth of the dive, the diver may also require protection from the cold. To protect the diver from the cold, or physical scratches and stings, most divers wear wet suits, or dry suits (for very cold conditions). Other equipment such as fins and face masks allow divers to swim and see clearly under water. Lake Travis is a reservoir on the Colorado River and is located in Central Texas, U.S.A. The lake stretches for 65 miles and has a maximum depth of approximately 680 feet, at it's middle. Due to its central location, the lake is widely used by Texas residents for recreational purposes, such as fishing, boating, swimming, picnicking, camping and scuba diving. The lake is used commonly for diving instruction to local Texas divers, as the lake offers a number of stretches where the depth is shallow - 30 feet or less, which is an ideal safe depth for learning to dive. One of the primary limitations of Lake Travis as a site for scuba diving is it's frequent poor visibility. The water visibility is greatly affected by environmental conditions. Visibility in the lake is at it's poorest after rain fall in the surrounding countryside, as water draining into the lake can disturb huge quantities of silt from the lake bottom. Although diving in the lake does not provide the most spectacular vistas to the diver, the lake has a number of interesting features to provide enjoyment to the novice learning diver. 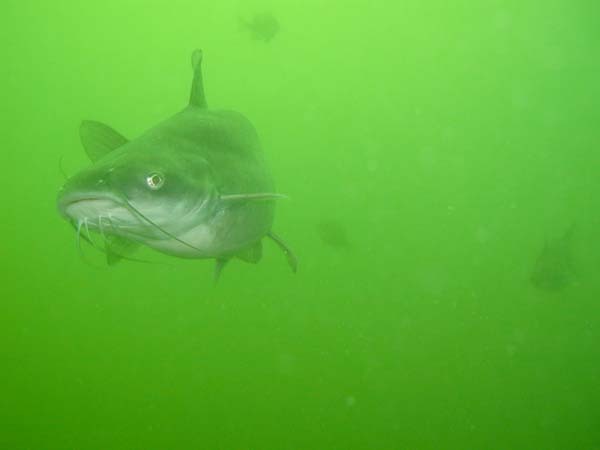 There are plenty of fish within the lake, most of which are fairly tame, especially around the periphery of the lake. It is common for divers to feed the fish with cans of vienna sausage, which the fish at least seem to enjoy. Cozumel is an island in the Caribbean Sea, off the eastern coast of Mexico. 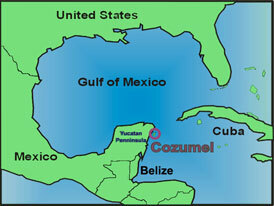 Cozumel is about 30 miles long and 10 miles wide. 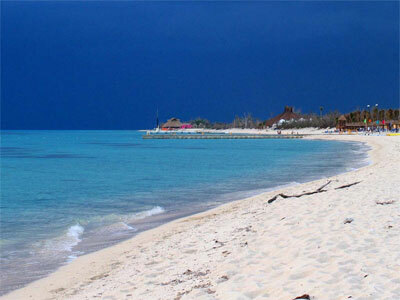 Cozumel currently has a population of about 73,000 people and was first settled by the Maya around 300 AD. A number of Mayan ruins can still be seen over the island. Unfortunately, the largest Mayan ruin on the island was destroyed during World War II, to accommodate an airplane landing strip. 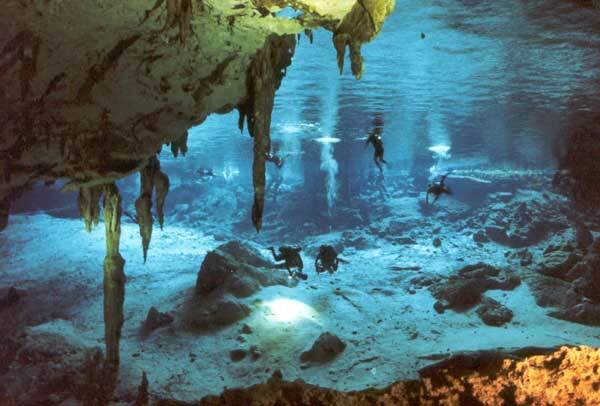 Cozumel's income is almost exclusively derived from fishing and diving. The island offers over 90 restaurants and many hotels to accommodate the plethora of scuba divers who visit the island annually. Cozumel has year long temperatures in the 80s F and boarders the Mesoamerican Reef. The Mesoamerican Reef is one of the largest coral reefs in the world. Cozumel also offers miles of sandy white beaches and even the shallow waters of the beaches abound with interesting marine life, which can readily be discerned by the casual snorkeler. Cozumel is by far one of the favorite destinations for scuba divers, due to it's warm, clear waters and huge diversity of marine animals and plants. The coral reefs around Cozumel is home to over 250 species of tropical fish. The reefs around Cozumel offer a wide variety of diving environments, from shear wall dives to drift dives. It is not uncommon to also see sharks, giant turtles and even octopi on a dive.